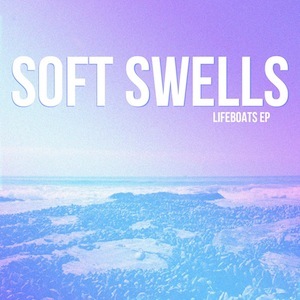 Soft Swells follows up on its 2012 self-titled debut album with a new little EP ditty titled Lifeboats. If the album name sounds familiar, it’s because the EP takes its title from the ninth track off the band’s 2012 effort. Tim Williams, the creative mind behind Los Angeles-based Soft Swells, looked across the pond once again to producer Dave Lynch in an effort to continue their collaborative partnership that began a few years prior. This time, Williams stayed put in his Los Feliz digs locally recording the new material then sending it to Lynch in England for him to fine-tune and finesse. The result is a seamless continuation of the good thing that Soft Swells had going on with its self-titled debut. The album starts out with a little off-kilter feel with an non-traditional percussive rhythm during the course of “Lifeboats.” “Summer” is a sunny tribute to Williams’ endless southern California summer. Coupled together with “Happier,” these tracks do their best to cling to the moment and seem to aptly convey Williams’ contentment and desire to live in-the-now.